For use at night in bed to keep creams on hands damaged by excessive hand washing.5 star product, very comfortable. I have dermatitis on my hands and these gloves are perfect when I put moisturiser on my skin, they avoid me spreading greasy finger marks on every thing I touch. The gloves fit well and so far have lasted better than I thought. I recommend these gloves for anyone who has skin problems and who works with their hands. the quality is reasonably good and each pair lasts well. 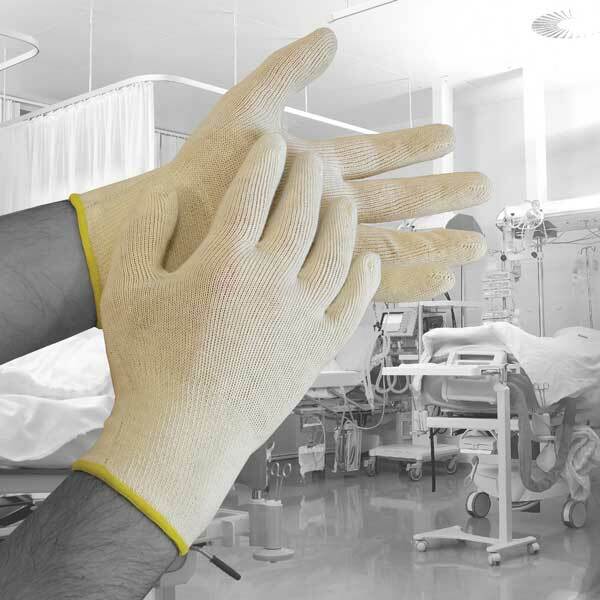 Use with vinyl gloves for household tasks to prevent flare ups of dermatitis. Better than using rubber gloves. 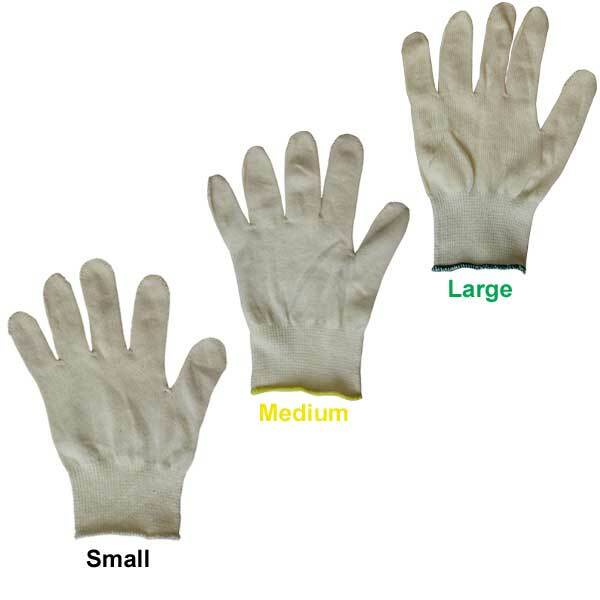 Good quality gloves which are able to withstand machine washing. I use them at night with petroleum jelly based products for problematic skin. They cover the wrist too and don't come off while sleeping. Although I normally wear a small size in gloves I found the fingers much too short so had to size up to medium which now fit my fingers but are too wide across the palm. Can't have everything I suppose!! The quality is excellent I would recommend them to anyone who has skin problems on their hands I would like to know if you also do fingerless gloves es as .Thank you . I use the gloves inside my boxing gloves. I have recommended them to others in my exercise group. The quality is excellent. an employee has sensitive skin, so his hands become sore with the dust involved in our workshop. Good quality. Use under *** gloves for warmth, comfort and to prevent irritation. I have used the gloves purchased underneath my rubber gloves for office cleaning purposes. Ordinary rubber gloves make my hands sweat and they become itchy. Would recommend to other cleaners with similar problem. Product quality is good. I Use these under thicker rubber gloves for heavy cleaning jobs. Washing car, gardening etc. I need to wear a skin cream on my hands at night and these gloves stop it getting on the bedding. They will also be great under latex gloves around the house and in the garden. Anyone who needs a cotton barrier glove on their hands. Excellent. They are well made, a good fit, cool and comfortable. I have no problems sleeping in them. Amazing gloves at competitive prices and they have helped protect my hands whilst they have repaired. Just what I needed, as I get eczema on my hands, so use them under the Blue Nitrile gloves in the garden, and on there own for cream treatments. Wash well, hopefully they will last a while! I use them to be able to touch things I otherwise would not be able to, the quality is great and I would recommend highly to anyone who suffers from contact dermatitis. I wish I'd found then ages ago, please keep the price competative as this is a great help to me. Thank you. these gloves are reasonably priced, good quality, very comfortable items used at night to help relieve symptoms of severe chronic skin condition. They wash very well at high temperatures which is essential for hygiene. I bought 30 pairs imagining they would not be substantial but they really are very robust! good quality and much cheaper than the boots equivalent! Good quality, used to protect hands after medical treatments. The quality is good I use for work as I have a problem with my hands. For bad eczema. Gloves of adequate size (I have large hands and previous "large" gloves have proved absurdley skimpy). The gloves were just what I was looking for. Gloves were perfect for my condition. I have psoriatic arthritis which affects my nails and the gloves allow me to be able to use my hands without to much pain. To soak handcream into my hands overnight!